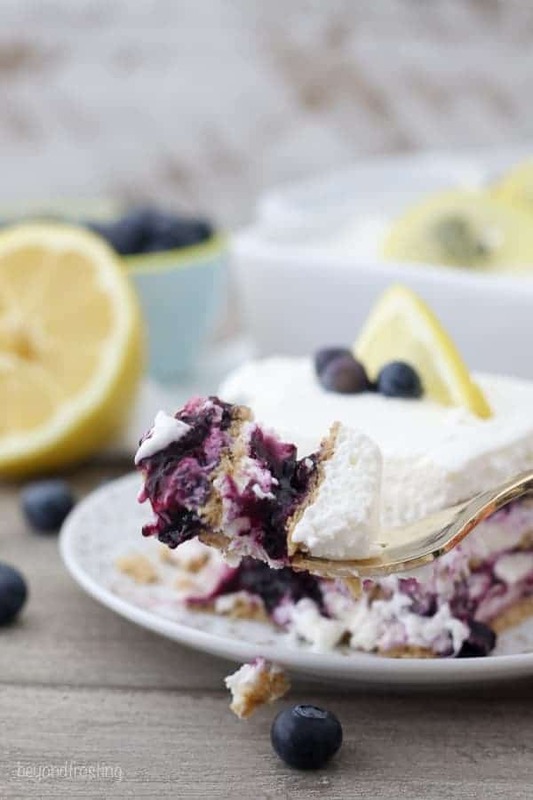 This Blueberry Lemon Cheesecake Icebox Cake is layers of honey graham crackers, a sweet blueberry sauce and a tangy lemon cheesecake. 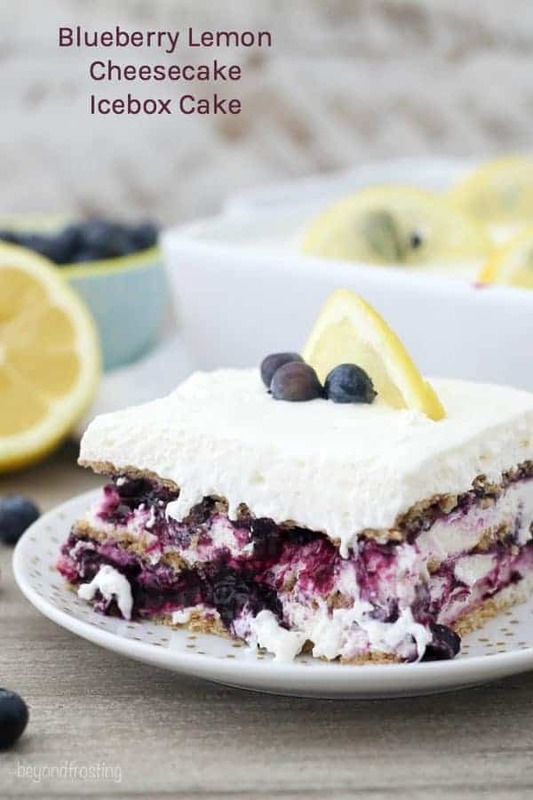 This no-bake dessert is the perfect for summer, and the homemade blueberry sauce is amazing! This past weekend we tried to escape the heat and got out into the mountains for a little hike to a well-known spot up in Mount Hood called Mirror Lake. It’s absolutely GORGEOUS! Highly recommended if you’re in the area. I honestly love being outside, as long as it’s not too hot and it’s not too buggy. Is that too much to ask? Summer is going to come to an end in the blink of an eye, but I am honestly done with the hot weather here. The temperatures were nearing 100 degrees here in Portland this past week and there was no way I could be baking in that kind of heat! 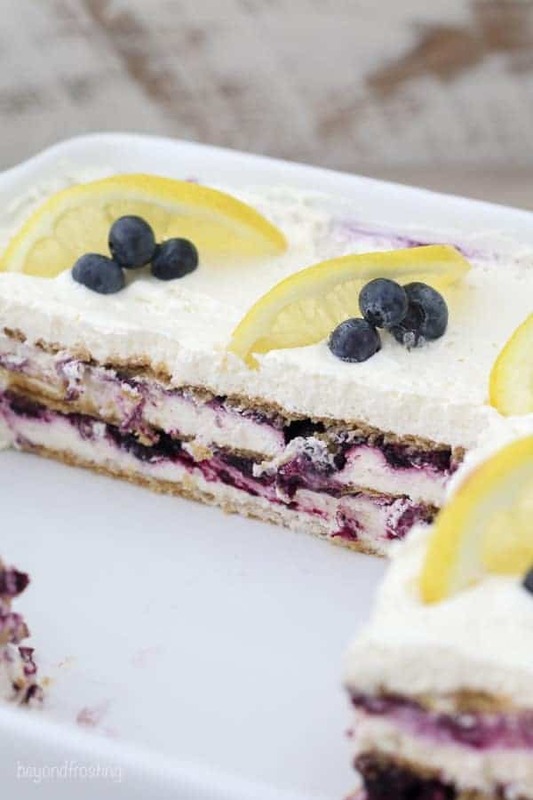 It’s the perfect excuse to make this No-Bake Blueberry Lemon Cheesecake Icebox Cake. I know, it’s a mouthful to say, but it’s so easy to make! 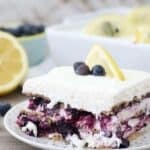 This icebox cake is layers of honey graham crackers, a sweet blueberry sauce and a tangy lemon cheesecake. I sometimes forget just how tasty these simple desserts are. When I first started making no-bake desserts, I did a lot of desserts lasagnas like my apple pie and s’mores lasagna. 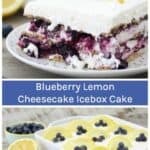 These are also icebox cakes with layers of graham crackers, a filling such as fruit, cheesecake or pudding and whipped topping. It’s been SO long since I made one of these! 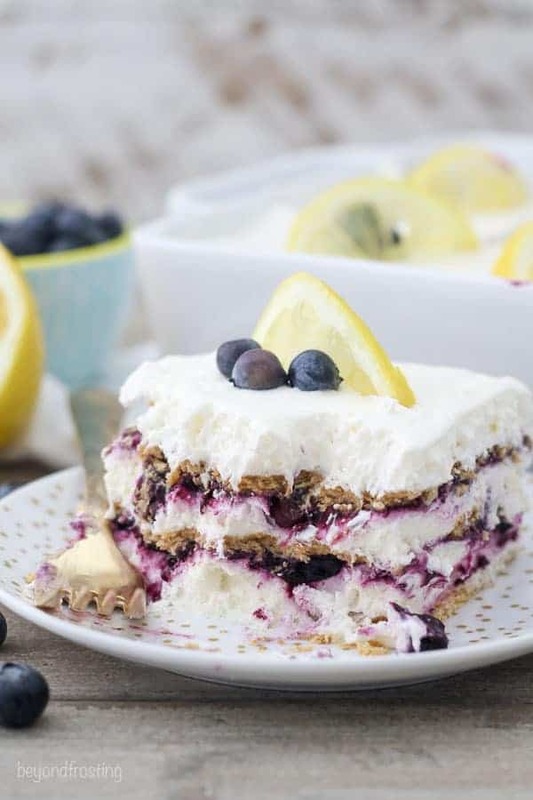 For this Blueberry Lemon Cheesecake Icebox Cake, we first start with a simple homemade blueberry sauce. 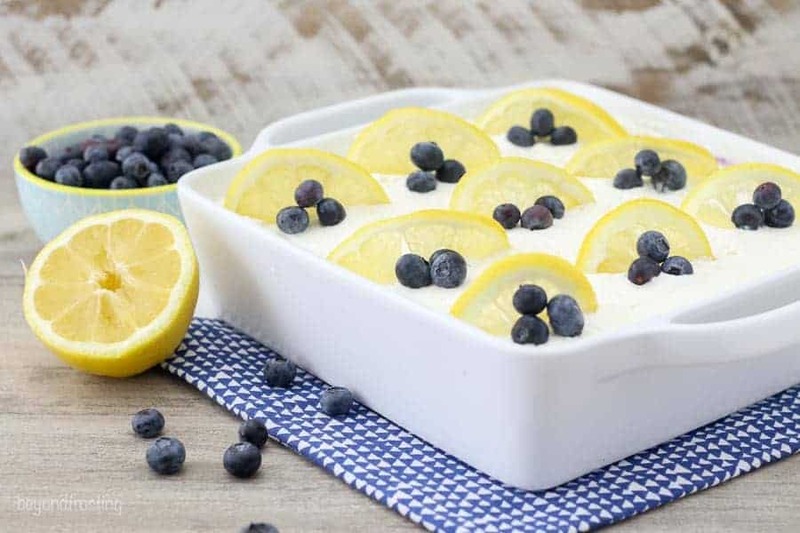 To make the blueberry sauce, the blueberries are cooked down with some sugar for sweetness, flour for thickening and lemon juice (or water) to maintain the saucy texture. This is the same blueberry sauce I’ve used for my Blueberry Cheesecake Poke Cake and the Blueberry Almond Bundt Cake. If you’re looking for a quicker option, try using some blueberry pie filling, you’ll probably need about half a can. 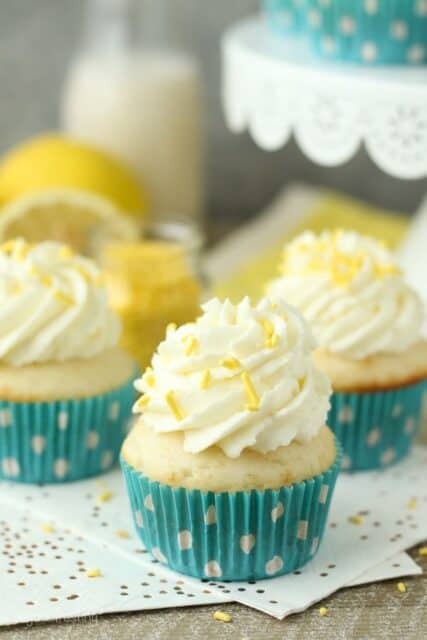 The filling is made with cream cheese, sugar, lemon zest and whipped cream. You can certainly use Cool Whip instead of whipped cream, but I find the homemade whipped cream to so much tastier. 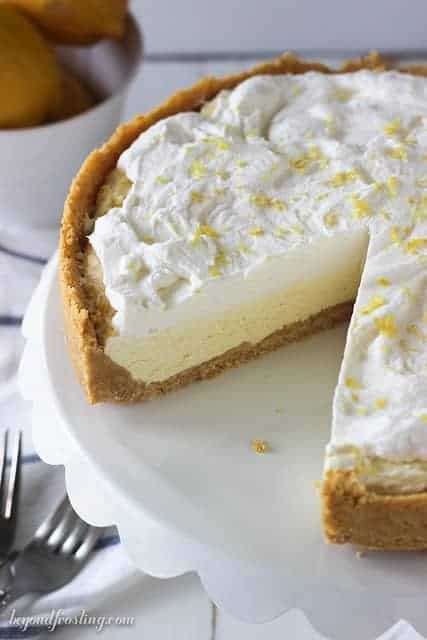 This lemon cheesecake is layered between the graham crackers. You’ll need about 9-12 graham crackers per layer. Once this icebox cake is assembled, throw it in the refrigerator for a few hours. The graham crackers soften to a cake-like texture. 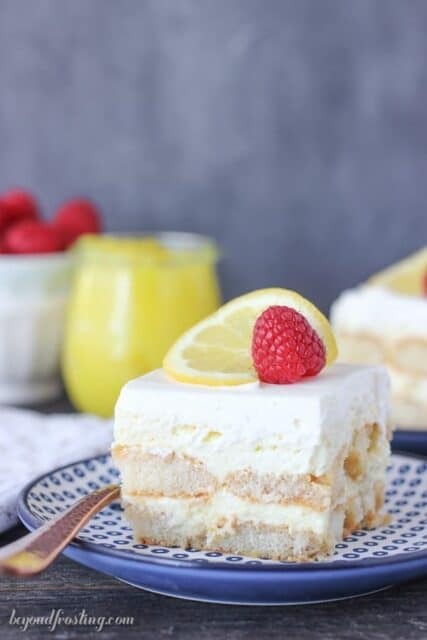 That is the beautiful thing about icebox cakes, the various textures and flavors all combine to make a mouthwatering dessert. Get to the kitchen and make this dessert before summer comes to an end! This Blueberry Lemon Cheesecake Icebox Cake is layers of honey graham crackers, a sweet blueberry sauce and a tangy lemon cheesecake. For the blueberry sauce: In a medium-sized sauce pan, combine blueberries, sugar, flour and lemon juice; stir well. Cook over medium-high heat until mixture starts to bubble, stirring often. Turn down heat and let simmer to allow the blueberries to soften. Cook until sauce thickens; about 10-15 minutes. Stir often so the bottom does not burn. Allow to cool for 20 minutes, refrigerate if necessary. For the cheesecake filling: Place the mixing bowl and whisk attachment in the freezer for 5 to 10 minutes to chill. Prepare the whipped cream. Pour the heavy whipping cream into the chilled bowl and use an electric mixer to beat the heavy cream on medium-high speed until the cream starts to thicken. Slowly add the powdered sugar and continue beating on high speed until stiff peaks form. Set the whipped cream aside. Beat the softened cream cheese until it’s completely smooth. Scrape down the sides of the bowl as needed. Next add the granulated sugar and lemon zest and continue beating until smooth. Finally, fold the prepared whipped cream into the cream cheese, stirring until well combined. To build the icebox cake, use a 9-inch by 13-inch pan and lay a piece of parchment paper on the bottom. Lay out the graham crackers to cover the bottom of the pan so there are as many large pieces as possible. For one edge, you will need to break the graham crackers apart or cut them with a serrated knife. Use an offset spatula and spread half of the cheesecake filling over the bottom layer of the graham crackers. You may need to use your fingers to hold the crackers together until you get this layer down. Then spread half the blueberry sauce over the cheesecake. Repeat these above steps one more time, layering the graham crackers, remaining cheesecake filling and blueberry sauce. Top with a layer of graham crackers. For the topping: Prepare another batch of whipped cream by placing your bowl in the freezer for 5-10 minutes. To prepare the whipped cream, pour the heavy whipping cream into the chilled bowl and use an electric mixer to beat the heavy cream on medium-high speed until the cream starts to thicken. Slowly add the powdered sugar and continue beating on high speed until stiff peaks form. Spread over the top of the graham crackers. Refrigerate for 3-4 hours. Garnish with any leftover berries or slices of lemon.